This isn't just a theme. This is more than a theme. This has Gantry and something new: the RokSprocket extension! Want to learn more about RokSprocket, then readon. RokSprocket is a new extension from RocketTheme that only works on Joomla 2.5 and it has been designed to replace a variety of their existing ‘content’ modules, such as RokStories, RokTabs, RokNewsPager, RokNewsflash, RokMicronews, and basically any module in the RT locker that manipulates and displays articles. So, you could call it an all in one module if you want and that is exactly what it does. 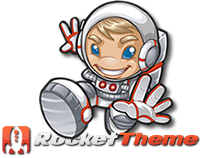 If you have an article in Joomla 2.5 - RokSprocket is the extension that you need. As of right now, I'm not sure if it is a club or free extension, but I'll update this post when I find out. Either way, the theme this month uses it and it really does look very nice.